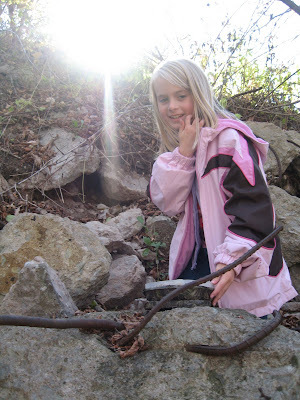 Letters to Elijah: Exercise, fresh air and some treasure hunting! A little while ago we had a beautiful day here in Wisconsin. With winter coming soon - you take advantage of every nice day you get! I took the kids letter boxing at a local park. Letter boxing is modern treasure hunting. You get a map and directions to find a box. The box was basically a Rubbermaid box with a secure lid and duct taped in camouflage tape. Inside the box is a notebook and a rubber stamp. 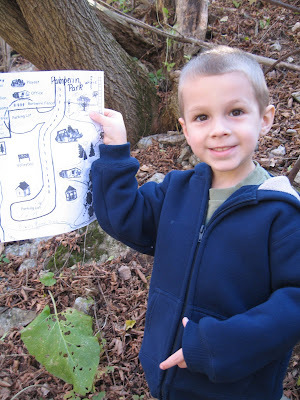 Elijah, helping with the map. You bring with you a notebook, rubber stamp and an ink pad. Once you find the box you stamp your notebook with the stamp you found and stamp their notebook with the stamp you brought. Sara finding her first box. Letter Boxing is a great way get some fresh air and enjoy God's beauty. (Plus - it's free!) It teaches kids how to read a map and use it in real life situations. When we got to the park Sara, didn't know which direction north was. I taught her how knowing the time of day and where the sun is can help with knowing which direction you are going. She even used my little trick to help remember North, East, South and West: N = Never, E = Eat, S = Shredded, W = Wheat. So before winter hits your area learn how to letterbox. It's a lot of fun! If you have older kids check geocatching! Oh my goodness my kids would love that! oh fun. thank you for sharing!! Sounds like fun! Where in the area was that? We went to Pamperin Park.. hwy 29 and 41. We stayed in our own city, but saw a part of it we never would have seen! Even Goose got excited as he pulled the "vegetation" back and saw the "sewage pipe" which was planted for others to find. On of the most exciting discoveries was the book was stamped by someone from League City, TX - where Grandma & Grandpa live!! It was a unanimous vote: we are going to plant a letterbox near the boat dock where my in-loves (in-laws) live. Thanks again for sharing! !